This Saturday, we’re cooking up an Italian feast of vegan Caesar salad, potato gnocchi, ragout of white beans, dressy string beans, and baked stuffed pears. A Taste of Italy, indeed. Sign up! I’m not going to lie. Adopting a plant-based diet is a snap, especially if your diet is based on whole food that already exists and is familiar – beans and legumes, fruits and vegetables, mushrooms, nuts and seeds, herbs and spices. Eating more healthfully or being vegetarian becomes a tad inconvenient when it comes to social situations. Pinoys love to get together and celebrate, and they love food too. Too much, I think, which isn’t necessarily a bad thing. Quintessential Filipino celebratory food is lechon; when having a beer with your friends, it’s chicharon. We just have to have pork on the table, right? Oh and if it ain’t fried, it ain’t food! 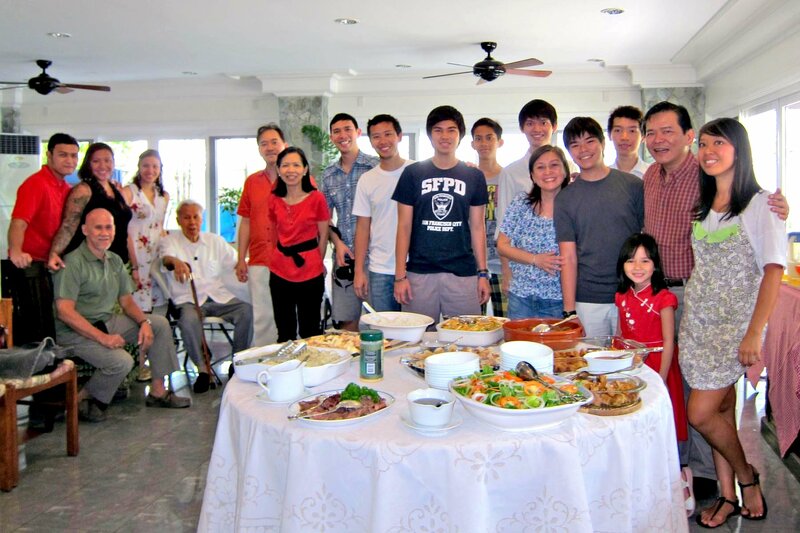 Family's still family, even with salad, a tofu dish, and a vegetable side dish on the buffet table. We think that food makes or breaks the party but if we think really hard about it, it’s not about the food. It’s about the people, and family, and celebrating friendships and relationships. The food is purely secondary. You can host your Lolo’s 91st birthday without that lechon. You can have a drink with your buddies without that chicharon. Oh and, you know what else? 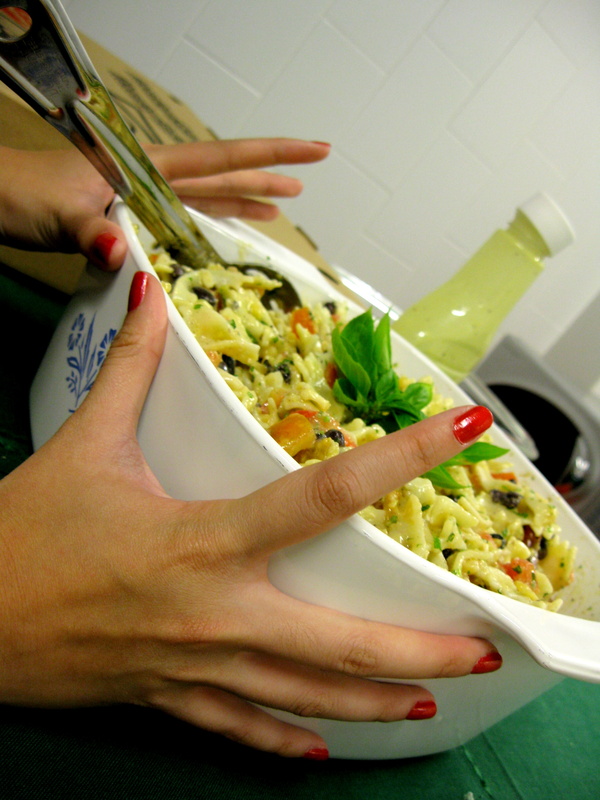 Serving healthy dishes doesn’t make you a party pooper. And hosting a vegetarian party doesn’t mean you’re hateful either. Okay. Say you’re invited to a friend’s house for dinner. Or maybe it’s a family reunion. As a vegetarian, how and what are you going to eat? The key is good communication with your host. One way is to inform your host or gently remind him / her of your diet. 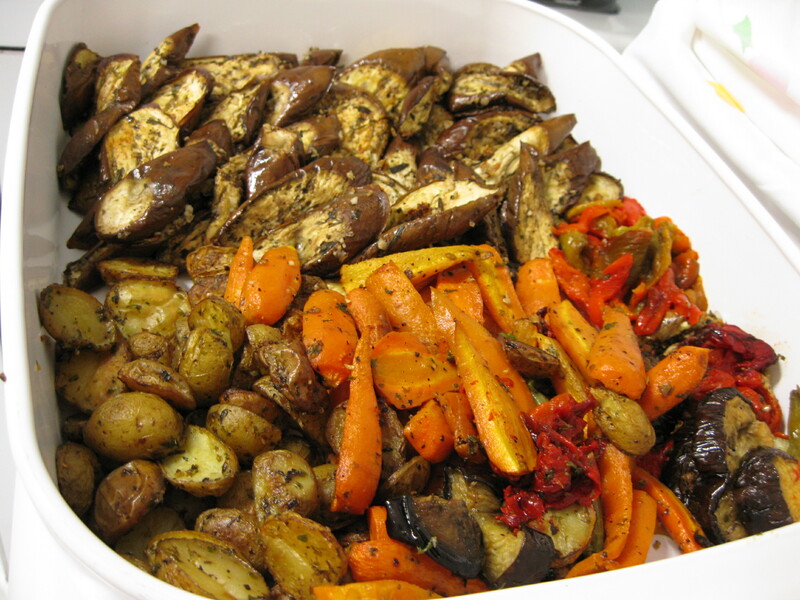 Ask what kind of food will be served and if it would be possible to have a vegetarian dish that everyone can enjoy. Be very respectful and grateful, but don’t apologize for your choice to be vegetarian. Friendliness over condescension. You and your host want everyone to have a good time. Lumpiang gulayis quite doable without having bits of pork or shrimp mixed in the togue. Mixing in chopped fried tofu is good but optional. 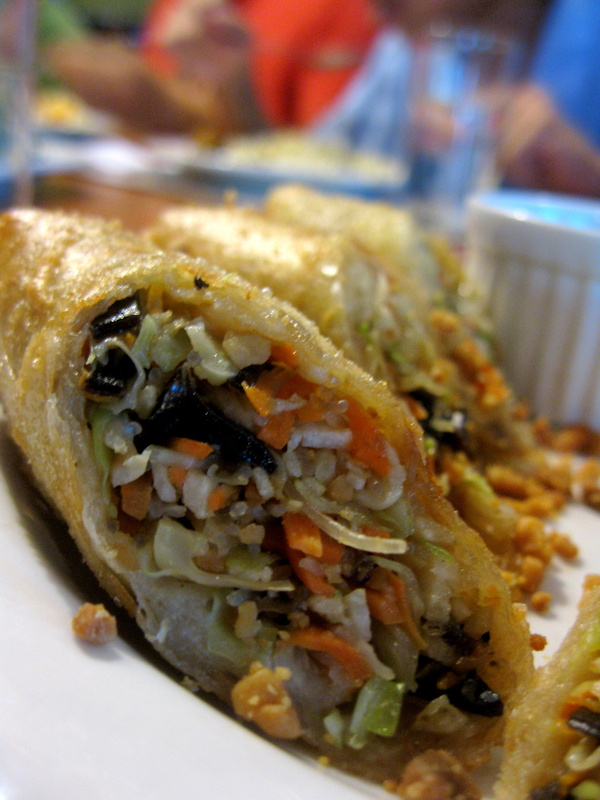 Yes, vegan lumpia can be enjoyable. Ensaladang talong is great without the ubiquitous bagoong. Dress it up with spiced vinegar. My favorite Filipino vinegar is Pinakurat. Ritual has a good selection of artisanal local vinegars. Plus points if the eggplant is grilled for extra yumminess. 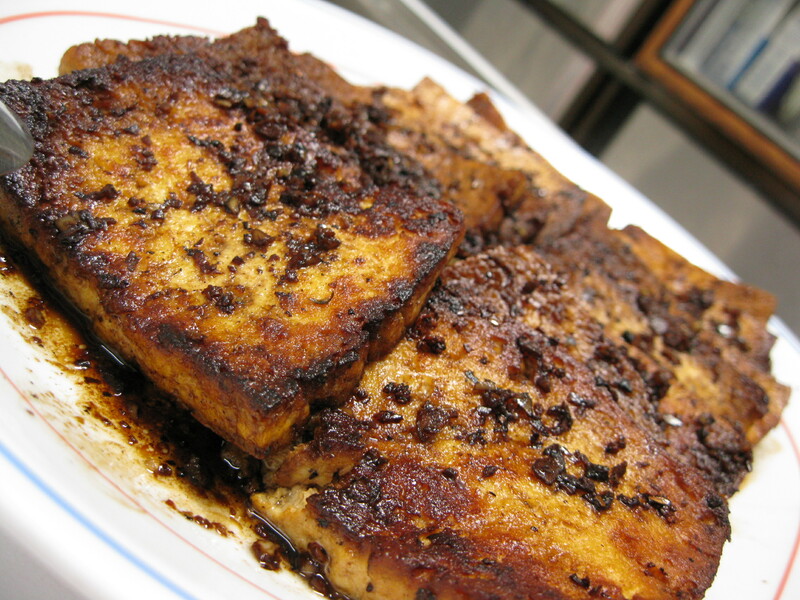 If something like beefsteak tagalog will be on the menu, perhaps tofu steak tagalog can be cooked as well. Tokwa’t baboy can be veganized by omitting the baboy. Still quite delicious. My favorite dressing is equal parts soy sauce, vinegar, and kalamansi. Add sili labuyo to your heart’s content. Anything in coconut milk is heaven, in my opinion. Gising gising can be cooked, again without the shrimp or pork. Flavor it up with more ginger. Pasta is always a popular celebratory food choice. A really easy dish would be spaghetti tossed in olive oil, garlic, fresh tomatoes, and herbs.Use fresh sliced mushrooms instead of tomatoes. Add some spinach or torn arugula. 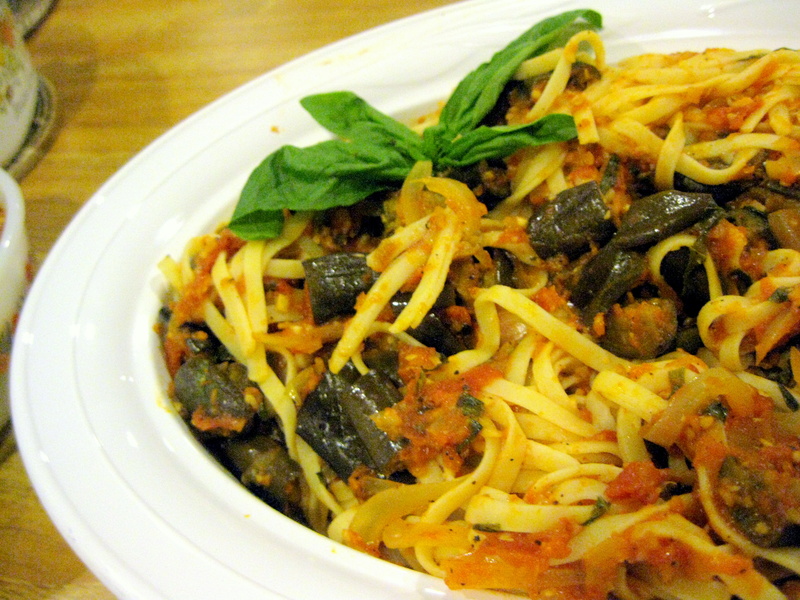 Tomato-based sauces work too – throw in some eggplant and / or zucchini. Canned chickpeas are super cheap and can be made super flavorful. Saute garlic, onions, and tomatoes; throw in the chickpeas and your herb of choice. Cilantro and basil are great options. My favorite way of handling social situations: volunteer to bring a dish or two to the gathering. Do keep in mind that you and your dish will be representing vegetarianism at its finest, so make sure that [a] you look amazing and [b] your dish looks and tastes amazing. Now isn’t the time to break out the carrot sticks, guys. You want flavorful, colorful dishes that POP. Bring a salad that wants to be eaten. We’re talking colorful here – add different toppings, such as dried fruit (raisins, dried mango), fresh fruit (apples, oranges, mango), fresh vegetables (thinly sliced carrots, singkamas, radish, peppers, tomatoes), roasted or grilled vegetables (eggplant, zucchini, beets, peppers), nuts (cashews, peanuts, walnuts). Dress it up right before serving. People seem to be going ga-ga over hummus these days. Bring a homemade batch and serve with wholewheat pita bread. Or, buy some wholewheat tortillas, slice them into wedges, and toast. Great crudite options are cucumber sticks and singkamas chips (try them out, for reals). I’ve got a simple hummus recipe here. 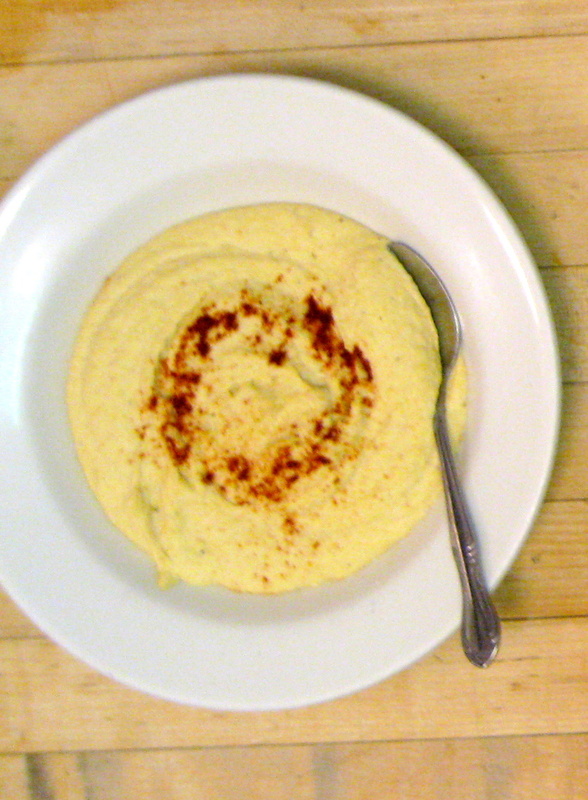 PS, you don’t need tahini to make great hummus. 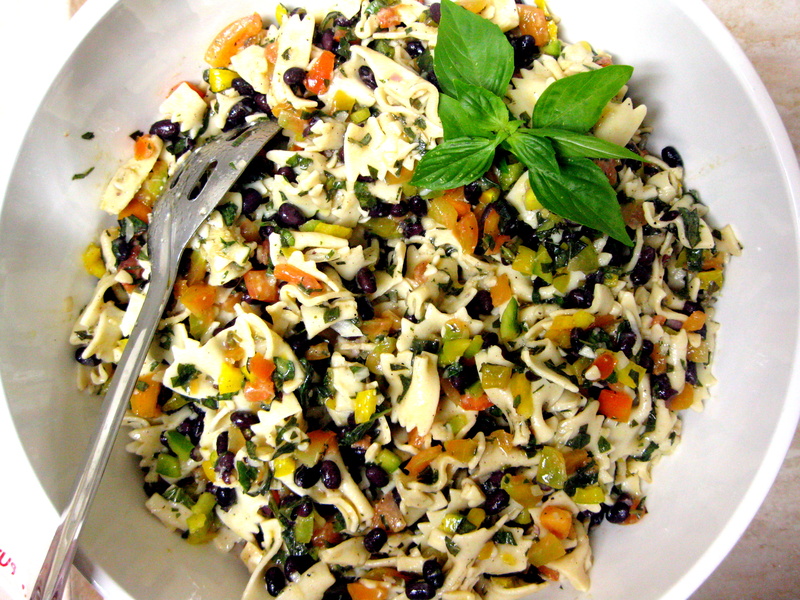 My black bean and farfalle recipe is pretty colorful and good too. Make a pasta dish as mentioned in #6 above! Please please roast up some veggies. Green beans, zucchini, broccoli, eggplant, carrots tomatoes, peppers, potatoes, etc. Not necessarily all together, but you get the picture. Dress with garlic. Such a simple dish to make but it never fails to wow people. 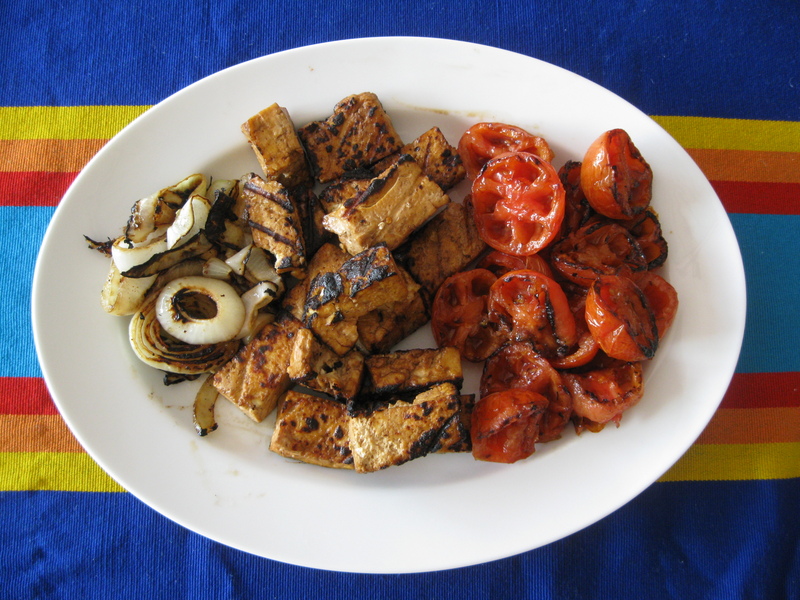 Saute or grill up some tofu. This is why last Saturday’s class was called Barbecue / Potluck Power. Grilled food is full of umami goodness. Marinade tofu in your favorite sauce. I like equal parts soy sauce, vinegar, and muscovado sugar. 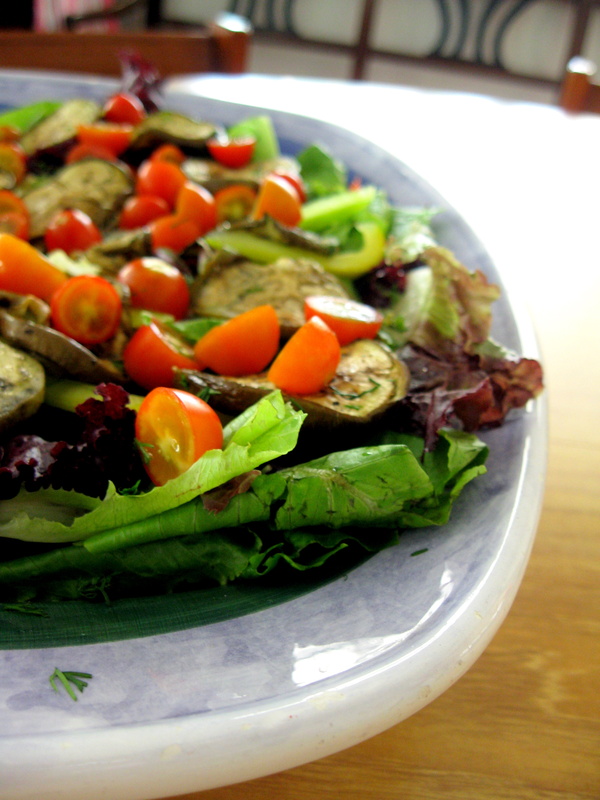 These are fairly simple vegetarian ideas that will work in social situations. Do try them out! Spread the vegetable love and inspire people that eating vegetables can be celebratory as well. This is really a great post! 🙂 More to come!